It's great when plants just reproduce themselves through splitting and making little offsets and stuff. You wind up with more plants without expending any energy at all. Several of my plants have done this lately, which is great. 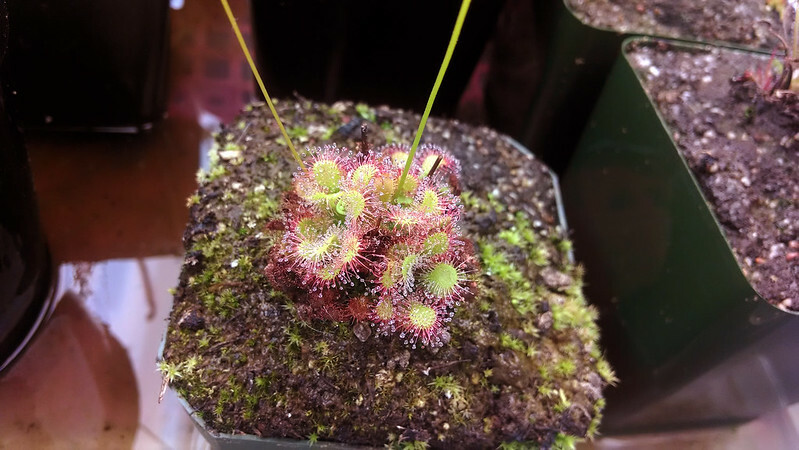 My Drosera capillaris has been flowering non-stop for months now. As recently as a few weeks ago I was getting concerned, because it was looking a little ragged – it seemed like all that blooming was tiring it out, and it might give up the ghost on me. I fed it several times though, and now it's looking as good as I've ever seen it. 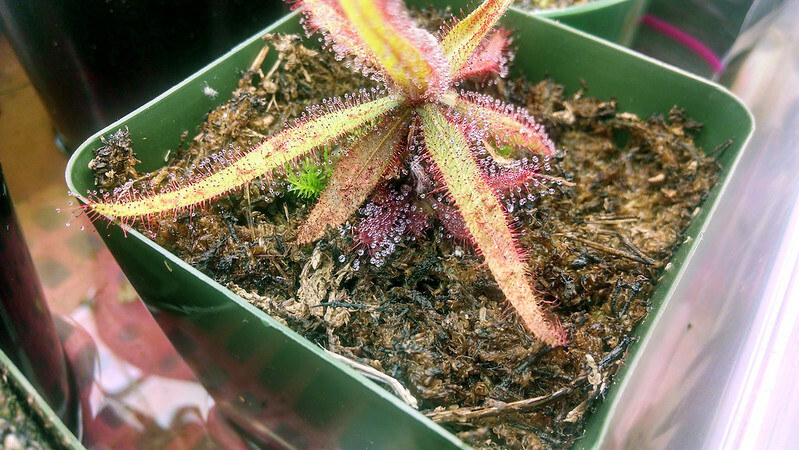 The pink tentacles make this one of my most adorable sundews. I guess I should say "they," since there are at least 4, maybe 5 plants in there. The next time I have a free afternoon to do some serious re-potting I'm gonna split these guys up and give them some breathing room. I've harvested a couple leaves as cuttings for trades, and it hasn't slowed this guy down at all. It's doing great! It takes to feeding very well, and constantly puts out new, longer leaves. And do you notice right there underneath? 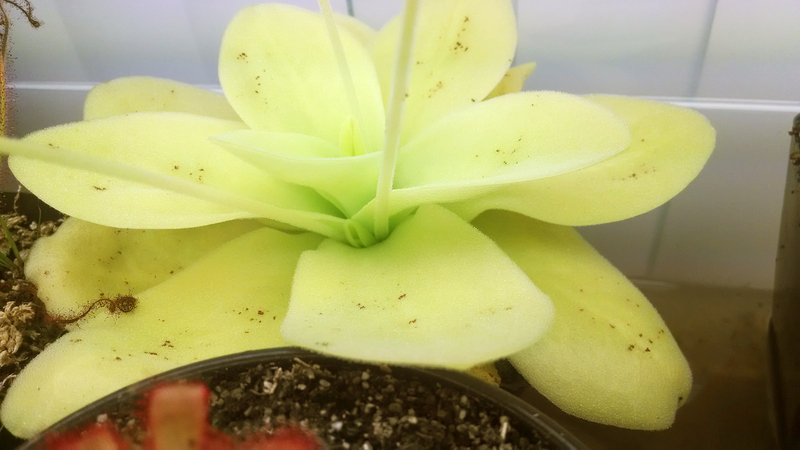 Such a dewy little plantlet. It's a baby! And it's about the same size as the mother plant was when I bought it. 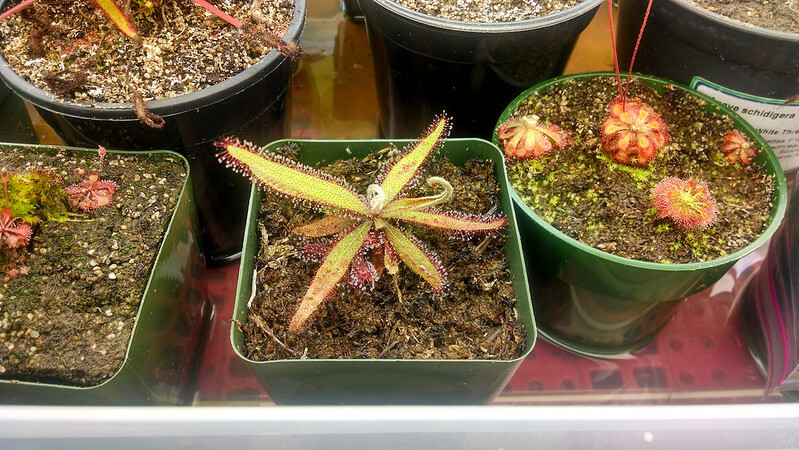 Check out the dewiness too – those are the largest dewdrops of any of my plants. I was really excited when I saw this. Finally, my Pinguicula gigantea has been flowering lately, which is delightful. I haven't had the time to try manually pollinating the flowers (which I should really do before the other two die off), but the plant is determined that I should have more than one. It's cool to catch the plant right at the beginning of division. See right there in the middle? It's forming a new growth point. Give it a month or two and I'll be able to split the pot. Good job little guy. Growing my collection has never been so easy.